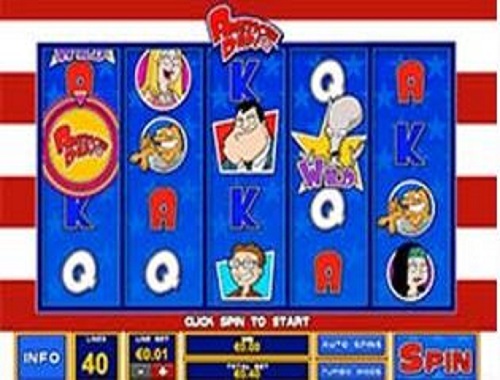 American Dad slot is themed on the cult American cartoon of the same name and Playtech have made a trademarked game from it to add to their DC Comics series, such as Superman The Movie and Green Lantern. The show began in 2005 created by Seth MacFarlane, Mike Barker, and Matt Weitzman and has seen 12 seasons and over 200 episodes and ranks along with South Park and Family Guy as one of the top ten adult cartoons of all time. 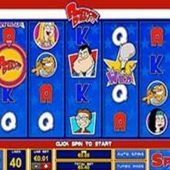 These games already have established and successful slots (NetEnt did South Park and IGT made a Family Guy slot) based on them so will American Dad join their ranks in the slots charts? We begin with 40 pay lines over 5 reels and 4 rows with the scene set in Langley Falls, and cartoon graphics and animations straight from the show and naturally the musical overlay and soundbites from the same. As well are the usual card icons there is the whole Smith clan too: Hayley, Klaus, Francine, Steve and Stan, the latter making the best 5-of-a-kind standard pay at 6.25x stake. There are no random in-play features but you do get Wilds in the form of Roger The Alien on all reels and like the rest of the symbols and he pays 18.75x stake for the 5 in a line. All the symbols appear singly including the Alien Wilds and they add no multiplier. There is one other very important icon, the Schmooblydong Bonus Wheel scatter which has a nice twist to it as we will find out shortly! Roger’s Random Wilds – Roger returns from a night on the lash and pukes green gushes of random wilds on every single free spin. The reel 3 Schmooblydong Bonus Wheel will have pre-selected the quantity of random wilds added (either 2, 3, 5 or 10 random wilds as mentioned above). Francine’s Holy Grail Spins – Klaus the talking-fish tries to get to Francine’s Holy Grail and his icons appear overlaying some reel positions. If Francine lands on a Klaus icon, the symbol turns into an expanding Wild. Again reel 3 will have pre-determine how many Klaus icons overlay the reel set. Wheels and Legman Wilds – Wheels and the Legman run across the reel set leaving a trail of wild symbols on every single free spin. The reel 3 Schmooblydong Bonus Wheel will determine the number of wilds that are added on the trail on each free spin. Hayley’s Progressive Multiplier Spins – first of all you begin with a multiplier set by reel 3 and Hayley collects signatures before each free spin which can increase this multiplier by 1x or 2x or it remains the same if the characters don't sign her notepad. Stacking Stan Spins – Stan the highest-paying standard symbol becomes stacked with more added under each occurrence of him on the reels - naturally the Schmooblydong Wheel on reel 3 determines the quantity of Stan symbols added per stack. Oh yes, that twist I mentioned - should you get the first 2 wheels on reels 1 and 3 but not the 5th. reel which you need to trigger the 3-25 free games, you get a consolation prize which is a single free game determined by the the first 2 Schmooblydong Bonus Wheels!